Djam Karet - "Suspension & Displacement" / "Collaborator" / "The Devouring" / "Still No Commercial Potential"
Since 1984, Djam Karet has been playing improvisational music that at times rocks very hard, and at others explores the cosmos with intricate guitar and keyboard dreamscapes. And given the right combination of discs to sample reveals a group of musicians who excel at either extreme. Based in California, the band consists of Gayle Ellett on guitars, keyboards and percussion, Mike Henderson on guitars, Chuck Oken Jr on drums, percussion, and keyboards, and Henry J. Osborne on bass, keyboards, and percussion. Djam Karet - "Suspension & Displacement"
"Suspension & Displacement" was originally released in 1991 as a double with "Burning The Hard City", the later being an album that was as aggressive as this disc is serene. This is very much a guitar album. But the focus is on creatively conceived soundscapes in which patterns and textures are painted on an aural canvas to produce music that is meditational, but complex in its execution. Robert's Fripp's guitar experimentations, Discipline-era King Crimson, David Torn, and Pink Floyd all came to mind as I lost myself in the music on this album. Among the highlight tracks is "Dark Clouds, No Rain", which opens with Frippoid guitar soundscapes set against an ambient background. Percussion soon enters the picture, opening the door for New Age keyboards and more guitars, one adding a harshness to the mix with it's fuzzy drone. An impressive collection of sounds, and reading the previous line I wonder if readers will consider this a strange conglomeration, but I assure you it's all very subtle and works quite well. "Angels Without Wings" is a similar track, but with multiple guitars picking steady runs rather than the mechanical Frippoid sound. "Erosion" is one of my favorite tracks on this CD. A repeating guitar pattern provides the base against which the music develops. Once again it's part Frippoid, but the Fripp feel is embedded in a dreamier cosmic excursion. The instrumental patterns develop very subtly, and only attentive listening will reveal the complexity of the music. There's the repeating patterns on the one hand, and the ambient textures on the other. But everything is cooperative and the contrasting elements fit together quite well. The pace picks up after a while and becomes a bit frantic, yet somehow remains calming. 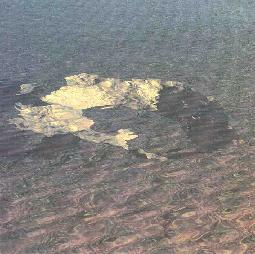 "Severed Moon" is similar to "Erosion". There's that repeating pattern again, but we hear deep space guitars. Tribal percussion takes over for a moment before a Pink Floydian "Welcome To The Machine" acoustic guitar begins to strum, accompanied by beautiful spacey landscapes. Ok, let's call it New Age music. Or at least what New Age music should be. Thoughtful, creative, complex, yet meditational and uplifting. The listener who just switched from Yanni doesn't need to know they're hearing great space music. Collaborator is precisely that... a collaborative effort between Djam Karet and Marc Anderson, Jeff Greinke, Walter Holland, Loren Nerell, Steve Roach, Kit Watkins, and Carl Weingarten. These wunderkinds of the electronic world recorded music in their own studios which were then sent to Djam Karet to add their own finishing touches. The music, for the most part, consists of ambient explorations, but the guitars and real percussion make the music fuller and more varied than most standard floating electronica. Among the standout tracks are "Cliff Spirits" (with Walter Holland), a gorgeous floating atmospheric piece with a throbbing drone. I like the faint sequenced bits that embellish the music and the combination of droning and angelic voices. On "Gondwanaland" (with Kit Watkins), flute and what sounds like Marimba give the music a world music feel that I can't quite place. But the beat and instrumentation is soothing, yet creatively complex. "Submersion" (with Loren Nerell) is an engaging piece. The music develops very slowly around one or two central drones. Little seems to be happening but I found the music quite trance inducing. And the strange voicings cropping up throughout the tune added a welcomed freaky element to the mix. "Moorings" is a track in which Watkins and Nerell team up with Djam Karet, and it's mucho spacey! An ambient dreamscape that includes swirling sounds (guitars? ), lightly struck bells, and well placed percussion. "Foreign Lesion" (with Marc Anderson) is one of the more percussion heavy tracks. I love electronica that makes full use of real percussion. The two go together so well and is often the leap from generic New Age to something truly creative. My hands down favorites on Collaborator, though, are the two Steve Roach tracks and "Salt Road" (with Carl Weingarten). "The Day After" (with Steve Roach) features a heavy bass that kicks out heart pounding notes as soundscape synths paint their cosmic tapestries and guitars play slow Pink Floydian licks that get increasingly more aggressive as the music develops. This is the closest to rock that Collaborator gets, yet the music is restrained enough to fit in with the album's overall theme of dreamy electronic explorations. "Food Chain" (also with Roach) is similar to "The Day After". The dreamy guitars are there, but it soon develops a beat that is far more head boppin' than other tracks on this disc. "Salt Road" could possibly be described as ambient Middle Eastern/Indian Blues. Huh??? Yeah, that's how it struck me. The bluesy part is slight, and probably unavoidable given that Weingarten is playing a dobro. It's also the one track that gets overtly into psychedelia. Trippy guitars and percussion that stirs up images of Persian markets, and crowd voice samples. Mucho cosmic. Like Suspension & Displacement, Collaborator highlights the true form of New Age music. It's cosmic and spiritually uplifting, yet clearly includes creative effort beyond just making music to meditate by. At the other extreme, on The Devouring the band explores heavy jam rock, space, psychedelia, and a variety of atmospherics. "Night Of The Mexican Goat Sucker" and "Forbidden By Rule" are real rockers and include gorgeous guitar soloing. This is soloing in the sense that the guitar doesn't step into the spotlight for a blazing moment, but rather the guitar plays tasteful lead lines throughout the song. "Forbidden By Rule" also features some orchestral mellotron and wailing psych guitar. On the spacier side are songs like "Lights Over Roswell", which starts as a trancey ambient piece and then starts to rock out a bit with the inclusion of violin and cosmic guitar. The dynamics shift around abruptly making this end up as a pretty intense tune. "The River Of No Return" reminded me very much of a tune off The Ritual Continues... I think the title track. The song opens with orchestral keyboards, gurgling synths, and soloing guitar. About four minutes into the song a steady rock beat is launched while the guitar continues its leads. A nice mixture of rock and spacey atmospherics. A few songs even sounded a bit Pink Floyd influenced. "Myth Of A White Jesus" is an easy-going track with slow tasteful Gilmourish soloing, and "The Indian Problem" is a Floyd-like ambient piece. "Room 40" sounded like a Wish You Were Here track, mostly due to the rhythms and keyboards. Overall, Djam Karet doesn't really sound like Pink Floyd, but they certainly share the ability to play easy-going, but wonderfully tasteful melodies. The band knows how to rock hard, but keeps the music at all times interesting. 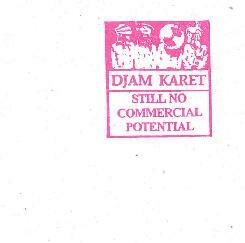 Djam Karet - "Still No Commercial Potential"
Djam Karet's first release in 1985 was a cassette entitled "No Commercial Potential". 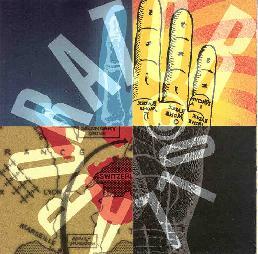 Years later, the band has released this CD of "Still No Commercial Potential" improvisations as a limited edition of 750 signed/numbered copies. As the liner notes say, "The music on this CD is wholly improvised with no predetermined structure, key or rhythm... we just tune up and play". While the music on this disc tends towards both the lighter and heavier sides of the band, in both cases it brings to mind the bands of the 70's. "No Vacancy At The Hotel Of Noise", "Room 24, Around Noon", and "The Black Line" all consist of ambient guitar soundscapes. But there's also, particularly on Room 24, a melodic progressive jazz fusion feel � la Holdsworth, UK, and the like. But there's no flashy pyrotechnics here. Just great notes and sounds as the band travels down a meandering, but linear, cosmic path. "Twilight In Lonely Lands" is a little different, having a spacey, jamming Krautrock feel, but ambient rather than harsh. "Night, But No Darkness" and "Strange Wine From A Twisted Fruit" are the rockers of this set. "Night, But No Darkness" brings to mind the organ heavy bands of the late 60's and early 70's. Atomic Rooster with a lead guitarist blasting off into an extended jam? The guitar soloing has that great rockin', but slightly fusiony feel that felt so good years ago, but there's also lots of raw chunky chords. And accompanied by the organ it makes for a great trip. "Strange Wine From A Twisted Fruit" features dual guitars, initially with one playing jazzy chords, and the other cranking out more rockin' solos. 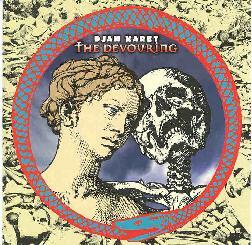 The soloing consists of long, whiney, shimmering licks, against a raw jamming rhythm section. The music gets increasingly intense as this 30 minute jam progresses until breaking into full band mode. Progressive, psychedelic, call it what you like... this is solid ROCK music. In summary, Djam Karet break no new ground here. What they do give us though is a cool set of instrumental explorations from an ensemble that is clearly comfortable with the silent communication that is required for good improvisation. Any sampling of Djam Karet should, at a minimum, include two CD's so the newcomer can experience the bands diverse interests. The Devouring should most definitely be one. I haven't heard Burning The Hard City but that should also be representative of the band's harsher rocking side. Note that both "Suspension & Displacement" and "Burning The Hard City" have been recently rereleased by Cuneiform Records. You can visit Djam Karet at their web site. Their CD's are also available through Cuneiform Records.